i.Think Panel Reviews - Legit or Scam? i.Think Panel Reviews – Legit or Scam? 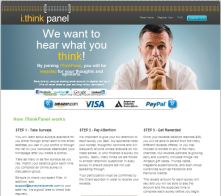 i.Think Panel, located at www.iThinkPanel.com, is a market research website that claims they “want to hear what you think” and they will reward you just for giving your thoughts and opinions. Market research companies are paid by companies and large corporations to conduct surveys, discussion groups, and panels, collect a large sample of data, and then report it back to their client company. You will earn credit for each research task you fulfill until you can redeem them for your chosen rewards. There is no charge to become a member of i.Think Panel and you may opt out of your membership at any time. After you fill out all of the registration information, including a working email address, surveys and discussion group invitations will be sent to your email address. You can participate in as many or as few of the invitations as you wish. After you complete your survey or discussion group, iThinkPanel.com waits to hear confirmation from their client company that the survey was successfully completed, and then you will receive your credit. Once you reach a minimum of $35 in credits, you will be able to redeem your credits for a reward. The rewards include Amazon gift cards, iTunes gift cards, magazine subscriptions, and virtual currency such as Farmville credits. Or, if you choose, you can donate credits to a charity that is partnered with i.Think Panel. But all regular prize redemptions require at least 3-4 weeks for fulfillment. iThinkPanel.com warns its members that their client companies want “honest, thoughtful opinions.” Because of this, they will disqualify anyone whose answers don’t make sense, or who finishes a survey too quickly. In fact, they embed something called “attention questions” into surveys to make sure people aren’t just randomly filling out answers. The reward for any given survey is different, as is the estimated time required to complete a survey, but this information will be given to you before you begin any survey so you can choose to take it or not. i Think Panel Surveys ? Average Rating for " i Think Panel Surveys " is 1.5 out of 5 based on 6 reviews. I am highly offended, disappointed and many other words! In many ways this makes me want to quit doing surveys altogether! its kind of devastating to the heart knowing youre getting jerked out of money and hours you put in! This survey company is a scam! In the many years I've been a member, I earned a grand total of $0.10. I entered all my information and tried to take many surveys. After all the qualifying questions I was told I could begin the survey, but 10 minutes into the survey I was told that I no longer qualify or that the survey had too many respondents. I wasted so much time and received nothing! Short surveys are ok, but i can absolutely not recommend anybody to take part in any long lasting project!!! I filled out a survey about two months ago. A reward 6.00 USD was promised for a project which included installing an app on a mobile phone. So i entered my no. and got that app on my phone. It is still installed and working properly. The app collects data of visited internet pages, sth. like that and it sends them regularly. you can also send manually to test it. And it works, i see that because i can see in the app menu when data was sent last time. my mobile got slower doing that time and after a while i asked the support how long i should keep it and when i will get my reward. This was the reply: "As stated in our terms and conditions it can take up to 4-6 weeks to post onto the account." After 2 months now the survey shows as invalid in my account on i.think.panel. The standard reply: " the survey marked as invalid by the client, the incentive will not be credited to your account". But nobody ever told me that anything was invalid before. I met all requirements. So if you take part in a long time project, it is very likely that you will never get an reward, also if you fullfill all the tasks and they tell you that they are not responsible, its some nameless client!! I asked them what they will be doing with my phone data and got no reply, also i never got an explanation about how to deeinstall the app completelely! I was recently told by the ithink support that I failed a quality check. This is Crap!!!! I completed all the surveys without One single invalid & now they say they can't pay me. I spent alot of time taking those surveys and it took me over 5 months to get to payout. I saved a printscreen as proof that all my surveys were VALID. This company as well as surveyhead have been known by members of surveypolice to cancel accounts WITHOUT a valid reason. They have the EXCUSE of inattentiveness, etc. What about valid surveys? Now they cancel people because of valid surveys? What I know is they allow new members, then when you get to the third payout, they decide they dont want to pay. Whoever rates this a 2 is a gullible member. Just wait, you are next. I just put in for my second gift card in 5 months(the first of which I got) I have 25$ in my account $9 of which is pending! After a month of waiting for my gift card today I signed in to see I was "rejected" I was not refunded my money nor was I given a reason or the gift card! I am waiting for customer support to get back to me. On top of having enough funds for ONE $25 gift card (countless hours of surveys) I have another $25 as i stated but they rejected this one which sounds like they will do the same to the next! I have had similar problems as Validated with installing apps and getting less than promised incentive! Also doing a survey for an hour and being logged out at the end to "reverify" signing back in nd not being given my due incentive! I wouldnt rant on this site if I did nothing but answer honestly and put in the TIME! They are outsourced and they skim off peoples earnings on top of getting paid from the companies who pay for THEIR "services"
I am in limbo I put in $75 worth of hours of surveys and I will be lucky to have gotten the 1 gift card I received! Not worth it! STAY AWAY! A friend of mine referred me and I have been receiving surveys and carefully answering the questions. I know my friend answers carefully also and has made printscreens of all her dashboard activity. This week she informed me ithink may be trying to scam her out of her latest payout. She was last paid in October by ithink and September by another company ithink is affiliated with called surveyhead surveys. She believes they are telling her she cannot log in because she recently reached payout AGAIN for November. She has signed up with Surveypolice & plans to contact the BBB if she is not paid or cannot sign in. Now I am not sure I want to continue my membership. I smell something rotten and I am waiting to see what happens to my friend.